Wide Plank Black Walnut Flooring is a unique and refined hardwood specie. We offer two grades in this unrivaled flooring option. Our select grade will feature rich chocolate heartwood, varying degrees of blonde sapwood, minor feathering and small pinhole knots. Our Sawyer’s Cut grade contains much of the same coloration as the select, yet allowing for a more rustic appearance containing sound knots and bark inclusions. 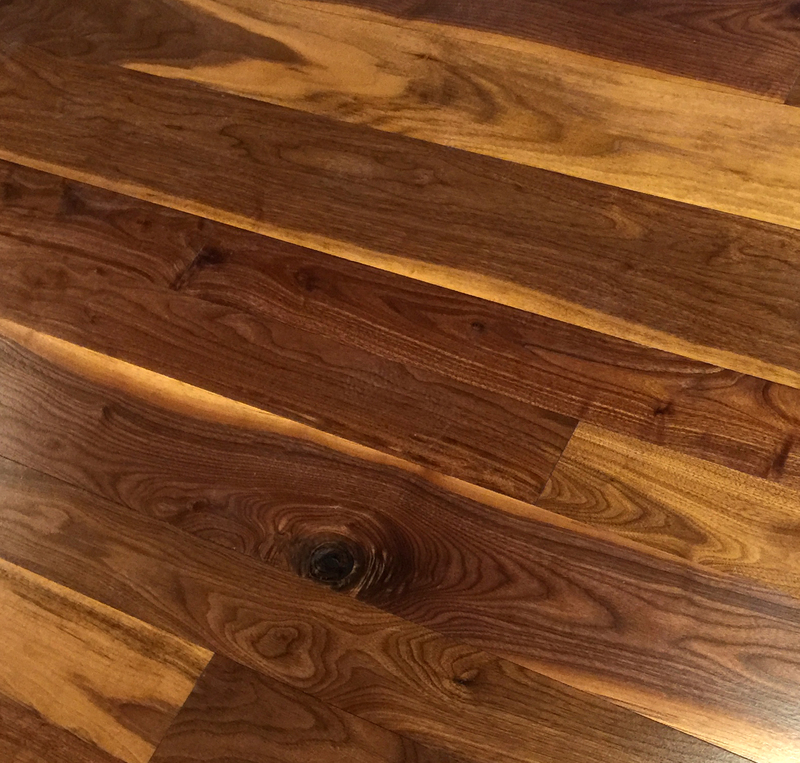 A softer yet durable hardwood, Black Walnut has been used in all facets of woodworking. We recommend pairing our Black Walnut flooring with an oil-based finish to bring out the depth and richness that naturally occurs within this flooring specie. Wide Plank Walnut contains a naturally darker color mixed with lighter blondes and tans. Traditionally Walnut is used for furniture pieces because of it’s naturally rich color. Black Walnut trees can be found in much of North America. Much of the walnut is harvested from trees in California. The roots of a walnut tree can grow up to 50′ from the base and emits an herbicide poisonous to many other plants and trees. It is also planted on hills and countrysides to help prevent erosion and is extremely resistant to pests and decay. *Please note that wood is a natural product and because of this, we recommend ordering samples of our products before making your flooring choice. We will send multiple pieces of each product to give a full representation of the grade and specie. Together, these pieces represent the grade, specie, or product specified. Please do not reference an individual sample, piece of the sample or image as an accurate representation of the entire grade, specie, or product. Please consult your sales representative with any questions or to request more samples.